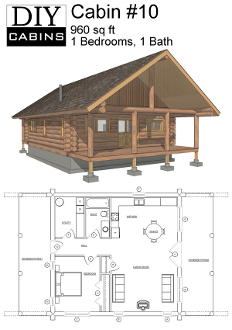 Log Cabin #10 is a 960 sq ft cabin with 1 bedroom and 1 bathroom. Cabin #10 is a spacious 1 bedroom cabin with 6'x30' coverred porches at each end of the cabin. A sizeable living room that has vaulted ceilings and flat ceilings in the bedroom and bath/utility areas. The spacious kitchen and dining area is perfect for family functions.